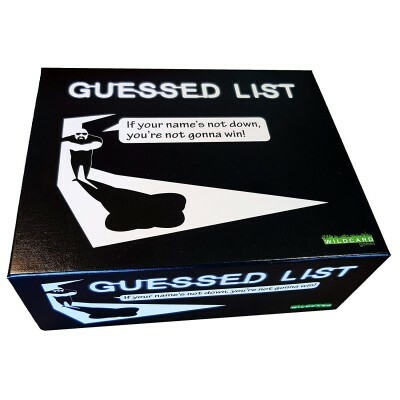 A simple fun fast party game for all where you choose a List Title and then shout out as many answers as you can in 30 seconds to try to guess a specific name on the Guessed List and win the card. Each List contains 6 names. Shake a dice to determine which name the bouncer needs to hear. Guess the name in 30 seconds to win the card. It's simple - If your name's not down you're not gonna win! No arguments. Don't matter who you are or who you know. Them's the rules. We've got every kind of list imaginable in the game from TV Chefs and Travel Show presenters to Cadburys Chocolate bars or Curry Flavours, from Famous Singers with One Name to Sports Personality winners. 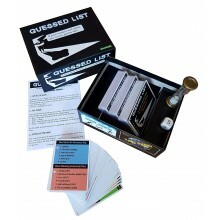 Win Cards to get your name on the Guessed List and enter the Winners Club and leave your mates outside. Choose a list, roll the die, guess the name, and win the card as you test your general knowledge and speed of recall. 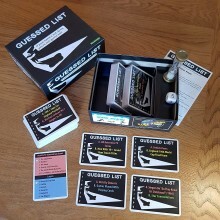 A great fun, rapid fire, quick thinking adrenalin rush of a quiz game for 2 or more players or teams. Can you get your name on the Guessed List?